Mr Mushtaque was born at The Whittington Hospital in London in 1968 and qualified from The University of Cambridge in 1991. During this time, he also attended Guy’s Hospital and St Thomas’s Hospital in London and obtained a First Class Honours degree in Clinical Pharmacology. Mr Mushtaque was first introduced to Spinal Surgery by Professor Alan Crockard when he was doing his basic surgical training at St Mary’s Hospital, which included an attachment at the National Hospital for Neurology and Neurosurgery in Queen’s Square London. Mr Mushtaque did his Doctorate of Medicine (DM) in the genetics of degenerative disc disease under Professor Robert Mulholland, Professor of Spinal Surgery at Nottingham University after he was awarded Fellowships from the Royal College of Surgeons of both England and Edinburgh (FRCS FRCSEd) in General Surgery. Mr Mushtaque was able to obtain a National Training Number on the North West Thames Orthopaedic Rotation. During his tenure as an Orthopaedic Registrar, Mr Mushtaque completed his Doctorate in 2004. In 2005, Mr Mushtaque’s work was recognised and he was awarded the Sir Robert Jones Gold medal by the British Orthopaedic Association. At this time, he began working exclusively in Spinal Surgery at the Royal National Orthopaedic Hospital in Stanmore and University College Hospital, London, shortly after being admitted on to the General Medical Council Specialist Register as an Orthopaedic Specialist. In 2006, Mr Mushtaque was awarded the Hunterian Professorship after his work was recognised by the Royal College of Surgeons’ of England. 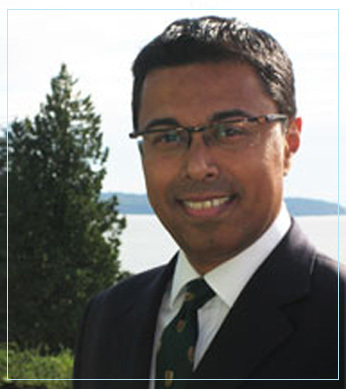 In the same year, he moved to Vancouver, Canada, to take up a place on the Combined Neurosurgical and Orthopaedic Spinal Programme. This 2-year complex spinal training programme, covered all the problems of the spine, from the base of skull to the sacrum, including infection, trauma, tumour, common degenerative spinal diseases as well as degenerative scoliosis. Mr Mushtaque returned to the United Kingdom in 2008 to deliver his Hunterian Oration at the British Orthopaedic Association National Congress and take up the post of a Consultant at the prestigious Birmingham Spinal Centre at The Royal Orthopaedic Hospital. Since his return to the UK, Mr Mushtaque has confined his practice exclusively to the spine. In 2013, Mr Mushtaque decided to concentrate his efforts exclusively in the private sector after having dedicated more than 20 years to the NHS. His private practice and practice with the NHS had grown tremendously, making it increasingly difficult to balance both. The mounting work pressure was affecting his work-life balance. This coupled with a change in management and management style at his NHS hospital, forced him leave the NHS. On the brighter side, Mr Mushtaque has been maintaining his links with both the Birmingham City University and University of Birmingham, allowing him to continue to teach and lecture at both these prestigious institutions. Mr Mushtaque is an avid skier and has a young family, residing in Edgbaston. He has two sons were also born at the Whittington Hospital in London, like himself. They were 2 and a half and 3 months old when he moved to Vancouver. His wife is a part-time GP in Walsall now and his daughter, born in 2008 at the Women’s Hospital in Birmingham, is generally in charge of the house.